Speakers at a function organized at the Russian Centre of Science and Culture (RCSC) in New Delhi on February, 8 paid rich tributes to Soviet cosmonaut Yuri Gagarin, world's first human being to travel in space accomplishing a historic scientific feat for the benefit of the entire humanity. The function comprised a Seminar "Russian-Indian Cooperation in the Field of Science", dedicated to the "Russian Science Day", and the inauguration of a Photo Exhibition "Breakthrough in Space", commemorating the 50th Anniversary of the First Human Space Flight-Yuri Gagarin's Flight into Outer Space". 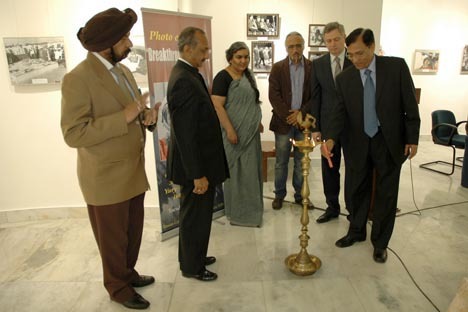 The photos displayed at the exhibition contained different facets of Yuri Gagarin's space odyssey that ushered the world into tremendous scientific advancement, plus the first Indian cosmonaut Sqn. Ldr. Rakesh Sharma's joint space flight with two Soviet cosmonauts-Y.V. Malyshev and G.M. Strekalov. In a nostalgic note, the Chief Guest Mr. Jai Prakash Agarwal, M.P. (Lok Sabha), President, Delhi Pradesh Congress Committee, Chairman, Housing Committee of Lok Sabha, recalled the memorable moments when he watched the grand welcome accorded to Yuri Gagarin by New Delhi Municipal Corporation at which his late father was the Deputy Mayor. He said that the substantial support provided by Russia from time to time in the field of science went a long way in the country's progress and self-sufficiency. In his welcome address, Mr. Fyodor A. Rozovskiy, Director, RCSC, referred to the rousing welcome accorded to Yuri Gagarin during his visit to India following his successful space, adding that he preferred India to be the first country for a goodwill visit in order to fulfill his cherished ambition. He referred to the bilateral tie-ups between Russia and India in the field of space science with special emphasis on the launching of Indian satellites Aryabhata and Bhaskara and the moon-mission Chandrayan. Dwelling at length upon the Indo-Russian cooperation and collaboration in diverse spheres of science and technology, particularly space science, Prof. Ramadhikari Kumar, President, Indian Association of Teachers of Russian Language and Literature (INDAPRYAL), underlined the prompt readiness and spontaneous response demonstrated by Russia which made India stronger than ever. In this context, he cited important fields and core sectors such as rocket-launching, computer science, electronics, missile development, laser technology, nuclear energy, powder metallurgy, steel industry, agriculture farming, etc. He wished the bilateral cooperation in science to grow stronger. Indicating the impressive photo exhibition as a potential source of inspiration to science enthusiasts, Dr. (Mrs.). N. Rathnasree, Director, Nehru Planetarium, lauded the amazing achievements made by Russia in the field of science, particularly space science. She emphasized that there are many things still to be explored and exploited in the field of astronomy and the celestial phenomena keeping in view the imperative of the urge and aspiration of younger generation. She profusely thanked RCSC for its appreciable efforts in organizing such creative events. Observing the studies on space science on a broader perspective, Mr. C. B. Devgun, President, Science Popularization Association of Communicators and Educators (SPACE), welcomed the commendable efforts taken by RCSC, and stressed the need of involving considerably larger sections of younger generation in relevant programmes on identical scientific topics. Dr. R. B. Singh, General Secretary, India-Russian Friendship Society (Delhi Unit), proposed a vote of thanks.